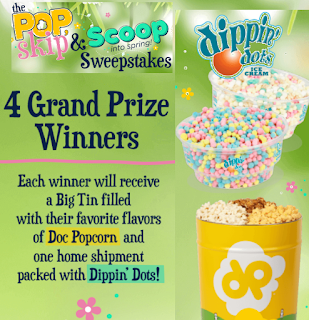 Grand Prize FOUR (4) GRAND PRIZES are available, each consisting of: (i) one (1) certificate redeemable for one (1) Dippin’ Dots home delivery shipment, each home delivery shipment consisting of one (1) 30-serving kit which shall include one (1) bulk bag (approx. 1 gallon) of Dippin’ Dots product which shall be mailed to the address provided by the Prize Winner in his/her entry or in response to the prize notification, said certificate expiring June 30, 2020; (ii) one (1) certificate redeemable for one (1) 3-Gallon Doc Popcorn tin consisting of up to three (3) flavors which shall be mailed to the address provided by the Prize Winner in his/her entry or in response to the prize notification, said certificate expiring June 30, 2020; (iii) free ground shipping of home delivery shipments redeemed pursuant to the certificates. Potential winners shall be contacted and confirmed in accordance with the Prize Selection Process and shall obtain certificate from Sponsor via electronic mail which must be redeemed online at a website provided by Sponsor on or by the expiration date. Total Actual Retail Value (“ARV”) of all Grand Prizes: $528.00.